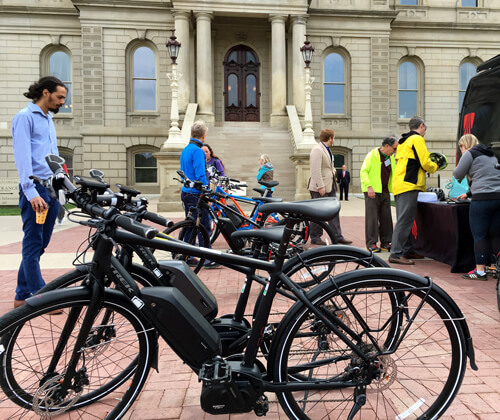 Three bills regarding electric-assist bicycles, or e-bikes, are scheduled for a hearing in front of the House Tourism and Outdoor Recreation Committee tomorrow, September 6, 2017, at noon in Lansing. The bills, HB 4781, 4782, and 4783, will make amendments to the Michigan Vehicle Code (MVC) to establish three definitions and classifications for e-bikes and will outline conditions for lawfully operating them on trails and roadways. LMB staff will be present at the hearing and will testify in support of the legislation. Our partners at the Michigan Trails and Greenways Alliance (MTGA) have created this useful synopsis of the bills explaining some of the reasons why both our organizations support them. The bills were crafted through the collaboration of a workgroup consisting of LMB, MTGA, the Michigan Mountain Bike Association (MMBA), the Michigan Environmental Council (MEC), the Department of Natural Resources (DNR), PEAC, a number of industry groups, and other interest groups. LMB has participated in a number of e-bike demonstrations throughout the year, including one held during our Lucinda Means Bicycle Advocacy Day. Our own experiences and interactions with the variety of people who rode e-bikes led us to the conclusion that they are not much different than traditional bicycles and thus should be treated as such. With the growing number of e-bike users across Michigan, there is an urgent need to clarify the classifications and regulations surrounding them. Increasingly, the lack of a definition in the MVC regarding e-bikes is contributing to confusion for law enforcement over license and operation requirements, as well as confusion for e-bike users, manufacturers, retailers, trail users, and land use managers. E-bikes provide exciting new opportunities to travel further, both for transportation and recreational purposes. This is especially true for individuals with disabilities or physical limitations. They also open economic doors for independent bike shops and for communities along trails that could see more visitors. LMB also strongly supports the bill’s assertion that local communities will have the power to make final decisions regarding e-bike use on all trail facilities. Wednesday’s hearing is open to the public. Anyone who wishes to contact committee members to voice their support or concern for these bills can find their contact information here. Anyone who wishes to submit written testimony ahead of the hearing can contact the Committee Clerk directly.